Wow, look at how far we've come. You're a real truck driver now. Graduated from school, got hired, finished your training, and now you're learning the ropes and making money. 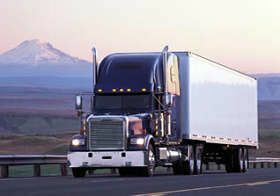 Now that you've just learned a whole lot of tips, tricks, ideas, expectations, and realities regarding you own company to help you get along better and get more freight sent your way, we'll turn our focus to helping you understand how to deal with the customers you'll be hauling the freight for. It doesn't matter how much freight you are able to get from your company, if you can't figure out how to get to the customers on time and get loaded and unloaded early sometimes you just aren't going to end up with as many miles as you would have otherwise. Let's get to it. Let's cover the process in the order it will happen. You're sitting at a truck stop empty and waiting for your next assignment. You hear the satcomm beep (satcomm is satellite communications – basically a satellite based email in your truck that allows you to type messages back and forth to your company) and your load information begins to come through. Awesome....you'll be making some money today! The directions have been put in there by other drivers that have gone to this customer and for whatever reason, they are usually wrong. You have the customer and load information and it's time to get moving. First of all you have to figure out how to get there and what route to take! Included in your load information will usually be directions to get to the shipper. OH, that's GREAT, RIGHT? No. Why NOT? Because if you follow the directions you are given, exactly the way they are written, I would estimate that about 80% of the time you will NOT get to your destination. The directions have been put in there by other drivers that have gone to this customer and for whatever reason, they are usually wrong. How in the world could a driver wind up putting the wrong directions in the computer when there will be tons of other drivers relying on them in the future? Hell if I know. It's one of those puzzling things you can't completely make sense out of. Sometimes it's a typo, sometimes it's simply confusing left and right, sometimes landmarks change (for instance 'take a right at the second light' used to be correct but now a new traffic light has been installed and the turn is actually at the third light), and some drivers are just idiots that couldn't find their way out of a paper bag. I've actually had a couple drivers tell me they've purposely put in the wrong directions because they hate their company and the drivers are a bunch of jerks anyway. Thanks a lot. I've actually had a couple drivers tell me they've purposely put in the wrong directions because they hate their company and the drivers are a bunch of jerks anyway. Thanks a lot. So what should you do? Couple of options. First, the most obvious....call the customer. Take a look at the map and find the town they're located in so you can tell them which direction you are coming from. When you get someone on the phone be aware of a couple things. First of all, some people are afraid to admit they don't know something because it will make them look stupid. These people will TRY to give you directions even though they really aren't sure. Listen, don't be afraid of hurting their feelings. If you sense this is happening, be nice but be firm. Explain to them that one wrong turn in a truck that's 65 feet long and 13 1⁄2 feet high can be disastrous.